With the intention of giving a voice to the people who are suffering from a war that is targeting them, Kohl's new short film Anarchy in the Philippines focuses on an underground community living on the outskirts of a society where looking different is a courageous act: “If you wear something different, you’re a drug addict”, says one of the main characters of Kohl’s film. “If you look different – you’re a drug addict again”. Through Kohl's intimate close-up filming style, we see the power, the anger, and the sweat that the punk scene exudes, getting up close and personal with the way that these people dress, the tattoos they engrave on their bodies, and the music they lose themselves in. Later this year, she will release a full-length cut of the film, with the aim of keeping this important story in the public consciousness. We spoke to Kohl about why she was drawn into this DIY community, and the fearful, adrenaline-fuelled process of shooting the film. What sparked your interest in the war on drugs in the Philippines and the subcultural response to it? Jess Kohl: My interest in the Philippines was sparked by the characters in my film – I'm interested in youth culture, subcultures, those on the fringes of society. I was aware of the crazy situation with the war on drugs in the Philippines, and I wanted to make a film that explored this through the microcosm of a marginalised subculture. Finding RJ and his friends was the perfect way to do this. Jess Kohl: I met RJ, one of the guys in the film, through research on social media. He pretty much convinced me to come and make this film; he kept sending me phone photos and videos of him and his friends. On a surface and aesthetic level, I'm interested in how foreign cultures adapt Western fashion and music and make it their own – but what really compelled me to make this film was to explore the effect that Duterte's war on drugs is having on this underground youth subculture in the Philippines today. Dedicating yourself to a DIY punk lifestyle is a commitment anywhere in the world, and you're going to be judged on your appearance wherever you're living. But when you're in a society whose judgments might lead to you being accused of being a drug addict – and therefore killed – the dedication to a punk lifestyle takes on a whole new meaning. It seems like people who are targeted by the war on drugs are living in constant fear in the Philippines. Did you feel people were particularly scared day to day? How do you think this fear manifested? Jess Kohl: The longer I spent in the Philippines, the more the severity of the situation hit home. Peoples' fear is much more insidious than I had expected – it's buried just under the surface. A few days into shooting, I realised my main characters – RJ, Ninoy, and Punk Ken – were actively avoiding talking to me about the war on drugs. When I asked them questions on camera, they would turn away, or pretend not to understand. It turned out they were scared of the repercussions of talking about the situation on camera. They’re vulnerable because of their place in society. What is it about the people that feature in your video that you find particularly intriguing or inspiring? Jess Kohl: A big part of what fascinated me about this group is their nomadic, traveller culture. They spend months on the road, hitchhiking on huge trucks, their home in their backpack, hustling by tattooing and making jewellery, begging for food to get by. This is contrasted by the fact that most of them have families – wives and kids. When they're traveling, they're on the hunt for escapism from the pressures of daily life in a third world country, and the added pressure of the backdrop of the war on drugs. I find their dedication to live an alternative lifestyle in the face of very real danger very inspiring. The community they’ve created is also inspiring – they’re so supportive of one another, everything they have is shared with one another. 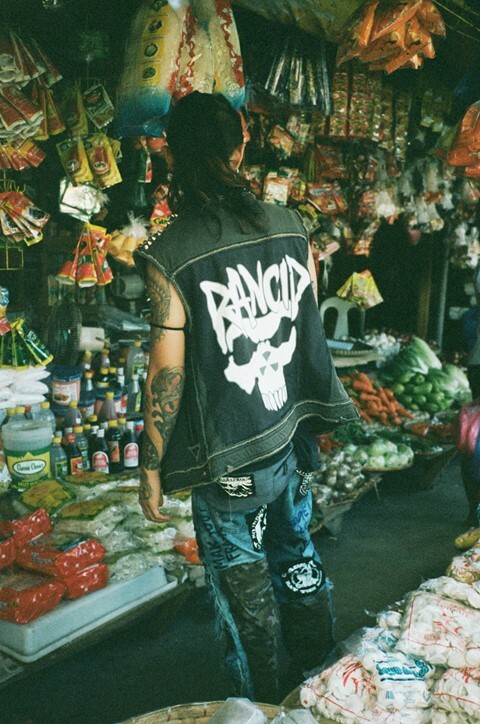 Why do you think that people in the punk scene in the Philippines take pride in looking, dressing, and being different? 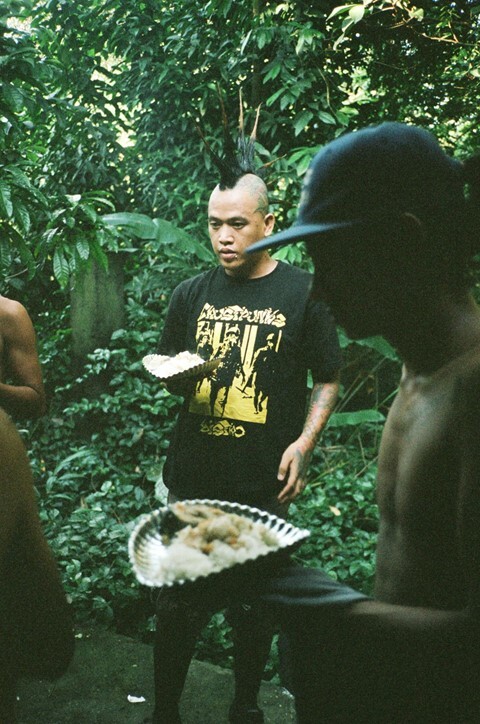 Jess Kohl: I think that people in the punk scene anywhere in the world take pride in looking, dressing and being different, and the Philippines is no different. Like Kiddie Punk says at the beginning of the film, ‘We wear black because of the darkness in everyday life...’ It’s a reaction to living in a society that you don’t necessarily feel included in, where you feel ostracised. But in the Philippines, it takes more effort to look different. Punk ‘gear’ isn’t accessible, so the community has become totally DIY – screen-printing their own bootleg t-shirts, making zines, becoming self-sufficient as a community. The film mentions that this war on drugs has also been named “a war on the poor” by the local people. What stood out for you as an indicator of just how bad the war is for the affected communities? Jess Kohl: I quickly realised after arriving in the Philippines that as a westerner, I was safe. The war on drugs is a form of social cleansing – Duterte is determined to eradicate those who he feels aren't serving society. So, anyone that isn't towing his line becomes a target. The longer I stayed in the Philippines, the more the severity of the situation hit home. For example, one night George (the lovely driver I had whilst there) told me he was going to sleep in his car instead of going home. There were killings happening in his neighbourhood, and he didn't feel safe to go home. 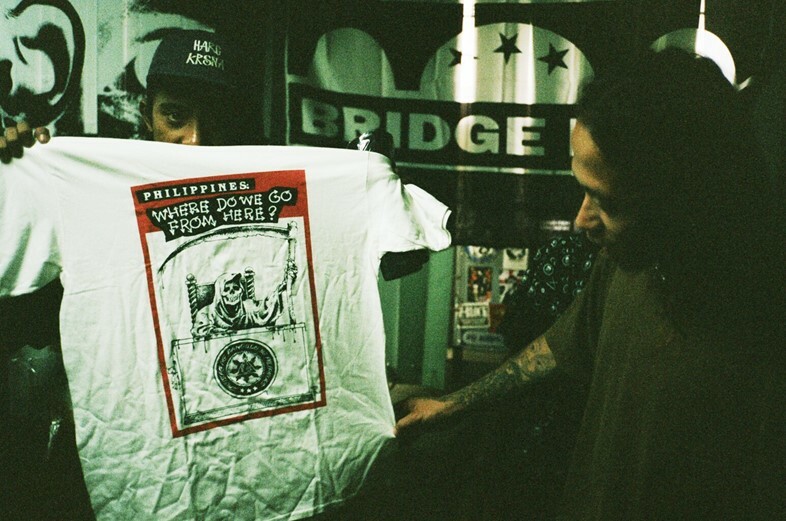 Another time, we were at a secret punk shop in Manila. After I’d stopped rolling the camera, the guy I was interviewing moved some records from a shelf – the shelf was a secret compartment to store an arsenal of weapons – he told me he needed to be ready for whatever was going to happen. What is the main message you want your film to convey? Jess Kohl: I want to give RJ and his friends a voice; to shed light on an unexpected subculture happening in a troubled part of the world. The war on drugs in the Philippines is still relatively unknown, and by telling this story through the microcosm of punk I hope it becomes accessible to a wider audience. We deeply regret that somewhere between the final edit and upload of the film a typo occurred on one of the contextual cards creating the impression that 13,000 people have been killed since January 2018. In fact reports on Duterte's 'war on drugs' state the overall death toll since June 2016 varies in number between 20,000 and 12,000. We're sincerely sorry for any offence this may have caused.